What a Beautiful Wreck...: "There are only two options regarding commitment: you're either in or you're out. There's no such thing as life in between." "There are only two options regarding commitment: you're either in or you're out. There's no such thing as life in between." On Thursday, July 21st, 2011, I did the hardest thing I've ever done in my life: I decided to change it. Completely, utterly, and dramatically. I got off the couch. On Saturday, September 22nd, 2012, as darkness shrouded Killington Mountain, a cold early-autumn breeze cutting through my ever-damp and muddy clothes, I did the second most difficult thing I've ever done in my life: I crossed the finish line of the Spartan Beast. The Beast was the race that started it all for me, as I stood filling up cups at the water station, on a whim, as volunteer. Now, it would serve as the shining capstone of accomplishment, in a year of physical and mental transformation. In an awesome turn of events, I had been adopted by the MA/New England Spahtens and ended up running the race with the very first Spartan Chick I ever met in person, Jessica. Jess and I buddied up as the mountain gradually separated racers into their "comfortable" paces (Are you ever really "comfortable" when trekking a mountain like this?). The next 8-9 hours were a blur, BlogLand. I can't describe to you the obstacles, the sights, the sounds... a week later and my brain can't even process the events of the day. In fact, I have written this post four times, this week, scrapping each attempt with disdain, not feeling like I've done justice to the epic scope of the event. With a little editorial help, a thought was given to me: I can't write it, because I'm afraid the result is not good enough. Fear. Fear was preventing me from writing about The Beast. With further reflection on this sudden profound thought, it occurred to me that that is what Spartan Race means when they tell you that You'll Know at the Finish Line. They can't tell you what you will have learned about your self, but they can tell you that you will cross that line a new person. Because you spent the entire race - be it sprint, super, beast or ultra - fighting your demons, eluding your insecurities and looking your Fear right in the face. As I stood at the base of Killington Mountain, goose-bumps rising in early fall breeze (or was that nerves and terror? ), standing shoulder to shoulder with the 300 Spartans that I would begin my journey with, I worried. Had I packed enough fuel? Was my recently-injured ankle going to hold up? Had I trained enough? Skipped too many runs? How stupid did I look in my spandex, next to all these Beast-worthy Spartans? Like the starting line of every Spartan Race, we were facing the mountain, knowing our first task would be to run up it. The purpose, I'm convinced, is so that as your adrenaline starts to surge through your body, you're left to ponder - with concern - that which lies ahead. At the very least, you start acknowledging the difficulty of what you are about to do. I stood staring up at Killington Mountain in quiet panic. THIS was a race for fit people. This was an event for real athletes. I knew, as much as anyone can know from scouring the rumors and FaceBook posts, how hard this was going to be - all part of the plan, Spartan Race? And yet. I was standing there. Obstacle One, Get Off Couch, Get to Starting Line: Complete. Jess and I had 8 hours of adventures that followed that first "Aroo!" and jog through the smoke and columns. With every minute the fears and challenges pressed in around us. Sometimes, they were external, as Spartan Race asked us to asses our fear of heights and swing from ropes suspended over frigid water; other times, they were internal, as your mind tried to convince your body it couldn't go on because the woods were too deep, the ascent too high, the wall too tall. Initially, your little battles lead to easy victories... The race gets you over some short walls, a mud pit or two, a jog through the sun. Minor challenges, easily surmountable when your brain is focused and your body is fresh. Here, where your fear is laid out neatly in front of you and your comfort thrown to the wind, Spartan Race - and it's participant - separates itself from every other race of it's kind: it dares you to go further. Can you stand your mental monologue while climbing up, sometimes on your hands and knees, a goat path through the woods, where there is no end in sight... just more UP? When you get to mile 8 or 9, after working for hours, will you heft that sandbag and pull that sled on muscles long burned out of their reserves... will you drop into another cold bath to conquer the rope traverse with your already chilled to the core body? When you crest the last hill, only to find a 10 foot wall at the top, and all part(s) of your body screaming at you (some louder than others), do you eye it with resolve to get up an over some way some how, or defeat, because you fear your body has nothing left? The Beast growled a greater challenge still to the Spartans that continued forth; it laid you bare to the bones of yourself. In a constant state of wet, gritty and muddy, your body already pushed, bruised, strained and pulled to every extreme, your knees and ankles aching from the extreme ups and downs, hunger sets in, and for me, so did the darkness. Still on the mountain, as the sun set and the light mist started to sputter from the solid-dark sky, we were handed our most primal fear - darkness. Could you press forth, hearing the skittering animal feet in the leaves to your right? Will you move forward and don your Hobie-Band (a rough obstacle for 13+ miles of mountain worn legs) to finish the obstacle, with just the dim circle of light from your headlamp? Finally, you hear it... the thumping music of the festival in the distance, signaling safety, sustenance and the right to stop. However, you emerge from the woods, hurting, wincing, sweating, but moving... only to find that The Beast is not done with you yet. You can see by fire light the comforts of The End, the arms of your supporters eager to hug their congratulations, the elusive green medals clinking in the distance, the thought of a warm sweatshirt at the forefront of your thoughts. .... and yet... you are sent down to your belly to crawl again, to fight past the throbbing in your knees and elbows as you roll them over rocks for the third time that day. You stand in front of the masses and hurl your spear with the desperation of a huntsman that hasn't brought down a catch in months, agonizingly burpeeing out the penalty of failure. Rallying your muscles to throw yourself into one last feat, you drag yourself to the top of the slippery wall, momentarily sitting on top of your plywood mountain to survey the homestretch. This is the moment that the Spartan in you awakens. So far beyond the tolerances you thought you had, the pain threshold you thought you knew, the steps your legs could take, the fear you thought you had, you find yourself eyeing the final two obstacles. At every Spartan Race, the last two obstacles are symbolic and integral to your Finish Line Realization. In the darkness, with a sputter of energy I didn't know I had, I ran - because every racer runs, regardless of their state at the time - into the horseshoe of fire. Spurred on by the race, the mountain, the misconceptions, the doubts, the obstacles that I was leaving behind and now surrounded by fire, you leap - flinging your arms into the air in triumph. Why is every racer's fire-jump picture so inspirational? Because it is here that they are reforged - literally in the fire - and emerge on the other side. Landing your jump, you have one last task before your Spartan realization is solidified: The Gladiator Pit. You - exhausted and depleted mentally and physically - are facing a gauntlet of formidable, armed opponents, focused only on delaying your crossing to the Finish Line. You Run (they always run. ), headlong, into the fray. Here, with every gladiator's jostle, every tap of the padded pugil stick, every evasive duck, you prevail against the forces that could've prevented you from finishing. A pugil stick for that seizing IT band, a dodge to the left for the thought process that told you you couldn't see the end, a shoulder check back to the gladiator for the moment a frustrated tear had welled up in your eye at mile 11. Bolstered by your victory, you bound - injured, cold, hungry and tired alike - across the finish line, skidding to a muddy stop to receive your prize. A medal. A medal placed around your neck, symbolizing all you've been through, all the monsters you faced, the fears you looked square in the eye. 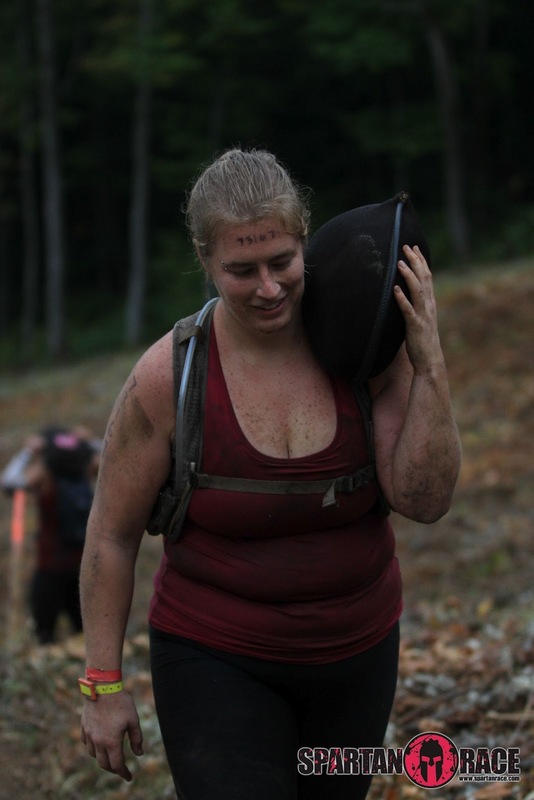 A medal, representing things singular to you and that finish line, capturing the old version of yourself that you gave to the mountain, and reminding your new Spartan Self from whence it came. You'll Know at the Finish Line, is the truth. What will you know? It depends on you, the day, the race, the mountain. 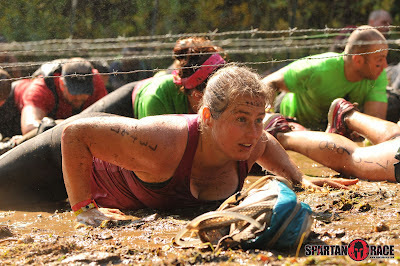 Tilting my head to receive my blazing green Beast medal, I knew that my friends and fellow Spartans were more important than my finish time, this *was* the body of an athlete in the making (even if it didn't look like it, especially in muddy spandex...), that I was tougher and more determined than any fear, doubt or insecurity I had, if I decided to be, and that I have no limits - because I can redefine them at will. A little over a year ago, sitting on my couch, I'd grown complacent with letting life happen to me and thought the possibility of becoming anything other than what I was was never going to happen. Running was impossible. Losing 80+ Pounds were impossible. Obstacles were impossible. Fitness was impossible. Now, I've completed the Spartan Beast (and with it, the cherished Trifecta) - 14 miles of the most difficult physical hell of my life, outlasted 70% of the racers that started, was still walking upright the next day, and began entertaining the thought of facing the Ultra Beast next year. Nothing is impossible; I know The Beast uttered a snarl of approval, as I learned that at the Finish Line. nothing more I can say than, YOU ROCK!! Found the link to this on Spartan Chicked. I'm so glad I clicked it! One of the most inspirational things I've read... thank you for making my day with this! I WILL be sharing this with many of my friends. Thank you. You are an inspiration to so many. Awesome read. I was there too that day and you so summed up all my thoughts that morning, day, and night.